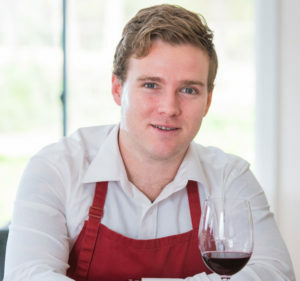 In preparation for an upcoming trip to Austria by Jack Simmonds, our Brand Ambassador, the Hahndorf Hill cellar door held a staff tasting evening focussing on three Austrian varieties – Gruner Veltliner, Blaufrankisch and Saint Laurent. The first wine tried for the evening in the ‘blind’ line-up of Austrian (and Hahndorf Hill) wines. Deep, golden yellow in colour. The aroma instantly screamed Reserve Gruner; I was almost certain I had tried this wine previously, but had not. Beautifully rich pineapple and chamomile tea notes supported by creamy apple, hay, grass and subtle mixed herbs. Oak-work and malolactic fermentation noticeable on the palate with gorgeous creamy texture coating the edges of a citrus-based core. Plenty of fresh acidity, plenty of citrus keeping this modest, lively and refreshing. Perhaps the most surprising wine to taste on the evening in many ways but for all the right reasons. I immediately thought that there had been a sneaky varietal thrown into the mix but time certainly changed my mind on that. Riesling-esque kerosene, key-lime and mineral notes were my first written notes; however within the space of a few minutes this wine had almost turned 180 degrees on me. Orange skin, dried peach and white pepper arose to the forefront by the time I had completed my first round of notes. Still fresh, very much so. Weighty, textural with serious length and authority. This wine didn’t quite have that same deep golden yellow colour that the last two wines had, yet what it had lacked in colour it certainly made up for in intensity. Unquestionably much riper and exotic in fruit character than the previous examples, displaying dried peach, pineapple, mango and ripe golden apples. There’s savoury elements and white pepper spice that sit in the background; no doubt this wine is all about the fruit. The one thing that drew me promptly to this wine was its density; that high intensity of aromas that leapt from the glass at first swirl followed directly through on the palate with power! All three wines bringing great pleasure to drink, all for different reasons too. It was also amazing to see the differences across the three wines despite all wines being so varietal and fresh. Reserve Gruners age so gracefully and gorgeously and should never be overlooked for the cellar. Classic style Blaufrankisch, and as one would expect – no oak-work in sight. Raspberries, purple flowers, blueberries and sour cherry character. Grainy, floating tannin and berry-like acidity to add to its juiciness. It’s ever-so approachable and glides through the palate with breeze. Like all the other wines, tasted blind. This really intrigued me from the get-go and I have written in my notes that it really reminded me of red wine aged in port or sherry barrels. Beautifully ripe blue and black fruits with that aroma reminiscent of port, ever-so-faint raisin character and then sweet earthy, oak notes. The sweetness certainly isn’t reflective in the palate; however the ripe fruit characters are. This was such an insanely youthful feeling wine, especially for its bottle age (despite not knowing at the time). Very reminiscent of young Burgundian Pinot Noir. Fresh red cherries, sour cherry, dried meats, earth and faint vanilla pod perfume are the most pronounced aromas with whole bunch / smoky / fire notes to back. 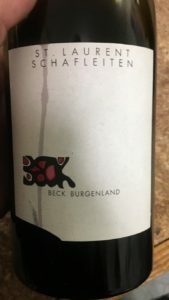 More-so on the medium-bodied spectrum with silky but firm tannins and that signature natural acidity that Blaufrankisch brings to the table. Long and rich finish. Delicious! 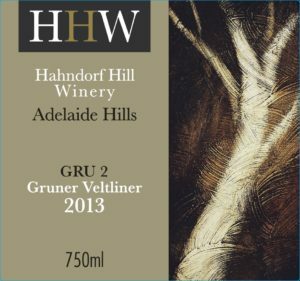 All of the lush and fresh blue-fruited characters that I associate with the Hahndorf Hill Blaufrankisch have turned to rich, ripe dark fruits. Aromas of blackberry jam, blood plum and sweet baking spice are easily perceptible and equally enticing. Wonderful to see how well this wine ages. One of the riper interpretations of the varietal that we tried throughout the evening but none-the-less very enjoyable. This was admittedly one of my favourite wines for the night too. The wine shows intense dried black fruits, rich raspberry and blackberry jam notes as well as black tea, leafy and stemmy scents too. The tannic profile here is still relatively firm but plenty of juicy acidity and flow creating a harmonious balance. Perhaps the most pronounced wine of the Blaufrankisch flight in terms of flavour intensity and aroma intensity. The type of wine I want to take in front of the fire on a winter’s day! “Wine of the night… so far” were my immediate reactions to this wine. It remained my favourite also. It’s bright, it’s juicy but that’s all hiding behind red pepper, dried chilli, tar and barnyard character. It’s fragrant, structural and I absolutely love the tannin profile. Behind the funkiness there is blackcurrant liqueur, leaves and ripe red raspberries. I can see how this may not be for everybody but in my opinion this is unreal! Such a subtle and pretty wine. The initial thoughts all revolved around how much this reminded me so much of the gentle pressings of red grapes at vintage time and all that beautiful seductive, sweetly-fruited juice. A little vegetal character but this all is ‘prettied’ up. Morello cherry, sweet baking spice, raspberries and strawberry character on the nose. Very juicy but with concentration, intensity and great persistence. This still feels very, very youthful and fresh. Classy, elegant but there is a spine to this wine too. A lot of pinot-esque character here; there’s red fruits in abundance and in particular red / sour cherries, pine and forest floor. There’s almost a watery texture to the acidity which works so harmoniously with the underlying mineral character that flows through the palate. 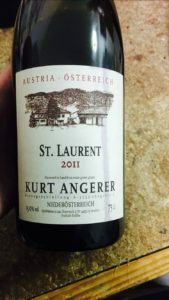 Last but not least was an Austrian blend thrown into the mix. Undoubtedly one of the riper wines we tried for the evening. The balance here structurally was extremely impressive, in particular its acidity. Notes of plum jam, ripe blackberries, violets and chocolate powder on the nose followed by an abundance of ripe, lush black fruits on the palate with great length. Definitely a crowd pleaser! 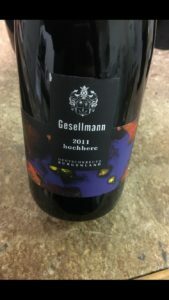 This entry was posted in Adelaide Hills, Adelaide Hills wine region, Blaufrankisch, cool climate wine, Gruner Veltliner, Hahndorf, Uncategorized, wine, Zweigelt and tagged Adelaide Hills, Adelaide Hills wine, Blaufrankisch, cool climate wines, Diurnal variation temperature grapes, Gru, Gruner Veltliner, Hahndorf Hill Gruner Veltliner, New Planting, St Laurent, Zweigelt, Zweigelt Australia. Bookmark the permalink.